Sorry for the short review here -- this falls into that one category of cards I hate. We already have King of the Swamp. Monster that not only searches Polymerization but is a Fusion Sub as well if you already have Polymerization. 1/5 all-around, as it's one of those cards that has a clearly better card out already. This card is completely pointless. I’ll say that right now. What Fusion Sage does, King of the Swamp does better. The only reason to run Fusion Sage would be that you want more than three ways to bring Polymerization straight to your hand, or you don’t have three Kings of the Swamp (but if you can’t get three Kings of the Swamp, it’s extremely unlikely that you’d be able to get Fusion Sage). Much like King of the Swamp, the only Fusion Deck you’ll really even want Polymerization for is a Dark Paladin Deck. Run this card if you have a lot of trouble drawing your Polymerizations, I guess…but the truth is that this was released in the TCG way too late to be effective. As New Week progresses, we come to Fusion Sage, a Spell that attempts to help the dying breed that is actual Fusion Summons. FS allows you to add a Polymerization in your Deck to your hand. After that your Deck is shuffled. The effect is EXTREMELY straightforward, and none to useful these days. Why? For the simple reason that we could use King of the Swamp instead. Not only does King have an identical effect to that of FS, but it can also be a Fusion-Substitute monster. And King should only be your alternative to FS in a Dark Paladin Deck, or a Deck that stays fateful to Fusion Summons. In any other Deck I’d advise just using Metamorphosis, or if you’re playing Traditional Magical Scientist. So to be blunt, don’t bother using FS. Ever. Advanced: 1/5. If you get a TP6 version of Fusion Sage, sell it. Traditional: 1/5. A 1 is supposedly the lowest rating allowed. Art: 2/5. Because I’ve yet to see a picture of Fusion Sage, I’ll need to go off of memory for the GBA artwork, which seemed to basically be some dude squeezing energy in his hand. dawnyoshi Fusion Sage is a nifty tutor spell that allows you to fetch Polymerization from your deck. This effect allows a deck reliant on fusions to be more consistent. 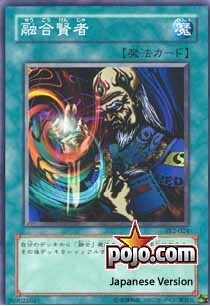 In fact, some decks may have actually considered this card for tournament play had it not been released about five years after Japan saw it. Since then, King of the Swamps has been released, and it's not only a fusion substitute, but it's a built-in Fusion Sage as well! Fusion Gate was also a nice way to make a Fusion Deck more consistent. Not only did it allow for multiple fusion summons, but it gave a deck utilizing the gate an alternate victory with Dimension Fusion power. This means that Fusion Sage is completely outdated and can no longer be seen as suitable for tournament play. Don't expect this fate for the new spell card to change either. The upcoming Elemental Heroes are better off with Fusion Gate for a variety of reasons. Fusion Sage; a simple review for a simple card. This card seems like a waste unless you have a Fusion deck and have already run most other “filler” draw cards. I say this because, if that is not the case, there are some very nice Fusion Substitutes you can use instead, some of which can also fill in for Polymerization. Ratings (All legal formats): 1.25/5-It has a use, just not that badly needed of one… maybe when the game was newer and we had fewer options. Well, this card lets you bring Polymerization from your deck to your hand and shuffle your deck. Very few decks, if any can use this card as everyone "Morphs" their for their Fusions now anyway. The only deck I really see this helping is possibly the Dark Paladin deck and that's a bit or a stretch too. You can already use King of the Swamp to help get Polymerization faster, but I suppose if you could somehow find the room, go ahead and use one in that deck as Dark Paladin can only be Fusion Summoned. Sorry to be short today, but there are few uses for this card unless you refuse to use Metamorphosis or simply don't have it. I mean, Fusion Gate is a better option.